The Duff's Trail Challenge started in 2011 with a goal to inspire you to hike all our local trails in one summer. Year after year more hikers join the Duff's Trail Challenge Hall of Fame, hiking all 12 trails in one summer. See the steps below to find out how you can be part of the challenge. Hike all 12 of the trails listed below from May 1st-Sept. 30th 2019. Snap a picture with you on each trail at a memorable landmark. You must be in the picture and your face must be showing. Once you have finished all the trails, email the 12 photos to duffstrailchallenge@gmail.com. Include you name in the email. Please allow 48 hours for confirmation that your pictures were approved. Duff's Trail Challenge finsihers receive a custom finisher t-shirt and goodie bag full of outdoor swag! You go down in our Duff's Trail Challenge Hall of Fame! Give us 48 hours after submitting your photos for a response via email. We will let you know via email when your goodie bag and tee are ready for pick up at the store. We require ALL 12 PHOTOS, one of you on each trail, in order to qualify. Photos of you at the trail head are not permitted as proof. No exceptions. Photos must be emailed in to duffstrailchallenge@gmail.com. We will not permit viewing them on your cell phone or tagged social media posts as a photo submission. Please remember to work your way up to the longer hikes and be safe! Wear good shoes, carry bear spray, and use common sense when traveling in the backcountry. Get a hiking buddy and if you hike alone ALWAYS tell someone when and where you are going and when you will be back. 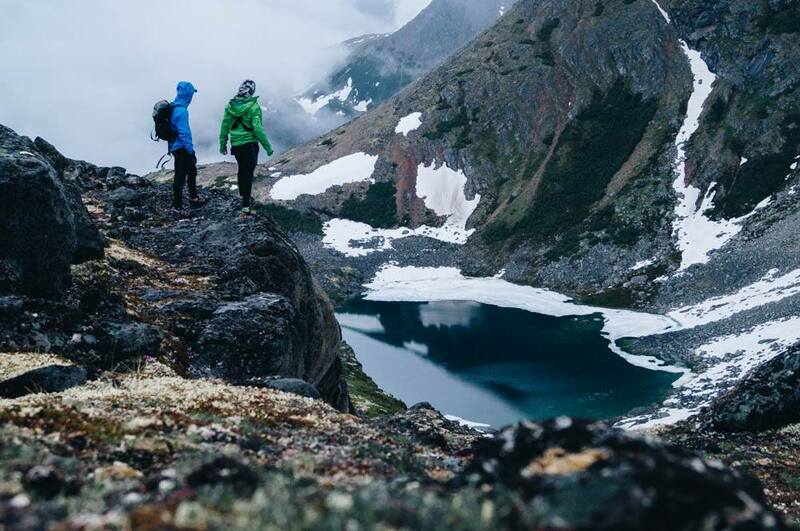 We STRONGLY recommend that you plan out your Chilkoot trail hike long in advance and take multiple days to hike it. Doing the Chilkoot in 1 day is very risky and only for serious athletes. Trust us on this one, take your time on the Chilkoot Trail! Visit the Klondike National Park Service webpage for more details about each hike.